EMERGE is an innovative platform for emerging creators to create new work on world-class dancers and present their work in one of the most exciting venues in New York City. 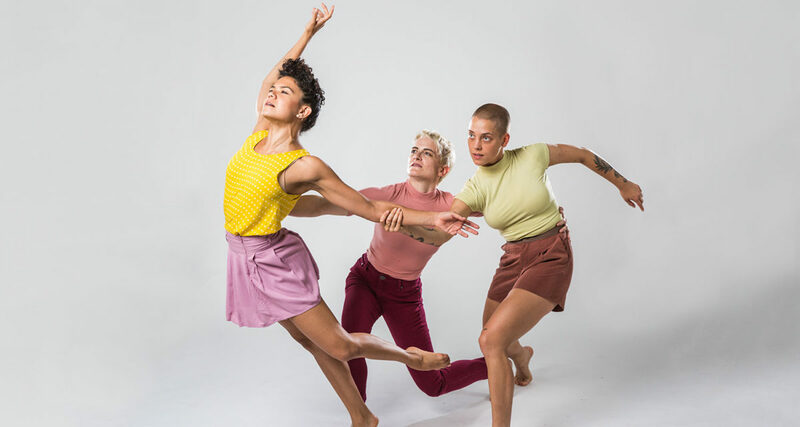 The 2019 EMERGE program features New York City-based choreographers Chanel DaSilva and Bobbi Jene Smith alongside the inaugural GDC/Springboard EMERGE Choreographic Award Winner, Los Angeles-based Micaela Taylor. Each artist will teach classes, offer creative process sessions and dialogues about the future of the dance field, and create a new work on GDC to premiere on a shared evening. EMERGE highlights the continual expansion of GDC’s mission: from its beginning 27 years ago as a vehicle for the choreographic vision of its Founder Gina Gibney, to then welcoming re-stagings and new commissions from a wide range of guest choreographers, and now providing visibility, resources, and space to the next generation of creators in the contemporary dance community. Don’t miss a post-show reception on opening night, and post-show discussion on Friday, May 3 moderated by Risa Steinberg. Please also join us for Living Gallery, presenting a free, live performance in Gibney’s Gallery with Aynsley Vandenbroucke on Friday, May 3 at 7:00 pm, prior to the performance. Chanel DaSilva is a native of Brooklyn, NY. She is a graduate of The Juilliard School, is a 2004 Presidential Scholar in the Arts and a 2011 Princess Grace Awardee. Chanel was a member of Trey McIntyre Project and of Lar Lubovitch Dance Company. Chanel has created works for Harvard Dance Project, American Repertory Theater, Gibney Dance Company, and her choreography has been performed at New York Live Arts, Lincoln Center, The Juilliard School among others. Alongside her partner Nigel Campbell, Chanel is the Co-Founder and Co-Director of MOVE(NYC). Chanel currently resides in Brooklyn, NY. From 2005-2014 Bobbi Jene Smith was a member of the Batsheva Dance Company. She is an alumnus of The Juilliard School & North Carolina School of the Arts. Her choreography has been presented by The Batsheva Dance Company, PS122, The Israel Museum, Luminato Festival, The Martha Graham Company, and CORPUS. Her film work includes “Annihilation” directed by Alex Garland and “MA” directed by Celia Rowlson-Hall. In 2018 she starred in the feature films “Mari” directed by Georgia Parris and “Aviva” by Boaz Yakin. She is currently a part-time faculty member at The Juilliard School, and guest teaching at NYU and UArts. Micaela Taylor is a professional dancer, teacher, and choreographer from Los Angeles, CA, where she trained at Marat Daukayev School of Ballet and Los Angeles County High School of the Arts. She graduated from Cornish College of the Arts and earned a Bachelor of Fine Arts degree in dance, 2014. She has worked and performed with Ate9 Dance Company, Zoe Scofield, Camille A. Brown, Kate Wallich, & BODYTRAFFIC. Nonetheless, her choreographic passion led her to found Los Angeles based contemporary dance company, The TL Collective in 2016. Her individual movement style of Hip Hop combined with contemporary technique has led her to find a new way for people to move which is best described as Contemporary/Pop. Alongside the launch of The TL Collective, Taylor has been commissioned to choreograph and teach by LA Contemporary Dance Company, AMDA College, Springboard Danse Montreal, MOVE(NYC), Cal State Long Beach, and Heidi Duckler Dance Theatre. Her work has been presented by Gelsey Kirkland Performing Arts Center, ACE Hotel, Raymond Kabaaz Theatre, Grand Performances, and Odyssey Theatre Ensemble. Risa Steinberg (Moderator), was born in New York City and graduated from Juilliard with a Bachelor of Fine Arts degree. She has been active in the dance community for more than 35 years as a performer, teacher, and re-constructor of José Limón’s work and mentor to young and emerging choreographers. She has traveled the world performing and teaching extensively. A former principal dancer with the José Limón Dance Company, Bill Cratty Dance Theater, Annabel Gamson, Anna Sokolow’s Player’s Project, Colin Connor, and American Repertory Dance Company of Los Angeles, Steinberg has also been a guest artist with choreographers including Wally Cardona, Sean Curran, and Danza Hoy of Caracas, Venezuela. Her acclaimed solo concert, A Celebration of Dance, featured a diverse repertoire which included work by Isadora Duncan and contemporary choreographers. As a re-constructor of Limón’s work, Steinberg has worked with companies and dancers including Nureyev and Friends, Frank Augustyn, and Karen Kain. She has been on the faculty at Juilliard since 2001 and held the position of associate director of Juilliard Dance from 2009-16. She was a dance panelist for the New York State Council on the Arts, is on the Artists Advisory board for the José Limón Dance Foundation, and serves on the selection committee for the “Bessie” Awards. Steinberg is the choreographic advisor and rehearsal coach for Brian Brooks Moving Company, Emory LeCrone, and Kate Weare Dance Company. She is a cast member of Sleep No More. With an uncompromising focus on artistic excellence and social integrity, GDC activates its dancers toward their full artistic, entrepreneurial, and socially-minded selves through rigorous physical, intellectual, and interpersonal practices. GDC’s vision is to not only cultivate the next leaders of the field, but to also provide a concrete example of the wide-reaching relevancy of artists in our society. GDC supports our Artistic Associates with 52-week contracts, health insurance and paid vacations.